German or American First to Fly? Swastikas a Felony in New York? 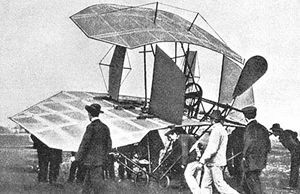 On August 18, 1903, on the Vahrenwalder Heide in Hannover, Germany, before four witnesses who notarized the event - and four months before the Wright Brothers made their inaugural flight in Kitty Hawk, NC - German Karl Jatho made a powered flight. His home-made plane flew for about 60-feet just under a foot above ground. He bettered this three months later by flying his plane for 262 feet at an altitude of more than nine feet. In the week of the 100th celebration of the Wright Brothers' inaugural flight in Kitty Hawk, NC, many are remembering other pioneers of flight that have been eclipsed by the famous duo. Karl Jatho died in 1933. A US federal judge has ruled that a former German concentration camp guard found living in the US would be deported, immigration officials said. Judge Larry Dean granted the Government's request to deport Johann Leprich in a written ruling issued in late November 2003. The 78-year-old retired machinist will be deported to his native Romania or possibly Germany or Hungary, said Greg Gagne, a spokesman for the Executive Office of Immigration Review. Leprich came to the United States in 1952 and became a citizen in 1958. But the Justice Department later discovered his National Socialist past and moved to revoke his citizenship in 1986. Leprich acknowledged serving during World War II in the Death's Head Battalion, a branch of the SS that supplied guards to concentration camps. He worked as a guard at Austria's Mauthausen concentration camp. At the end of a 1987 denaturalization hearing in Detroit federal court, Leprich moved to Canada. But evidence surfaced that Leprich continued to live secretly in the United States. Federal agents began looking for him, and his case was featured on the television show America's Most Wanted in 1997. On July 1, authorities found him hiding behind a panel under the basement stairs at his family's home 25 miles northeast of Detroit. He has been jailed since then while the Justice Department sought a deportation order. (AP, November 25, 2003) Compare that effort to get rid of one legal immigrant with the efforts made by US authorities to get rid of millions of illegal immigrants. Just on December 26, 2003, the Simon Wiesenthal Center had announced that a similar denunciation phone line had been established in Austria. It is not known whether this report about Romania is just a repetition, with Metro having confused Austria with Romania. But considering the reliability of today's media, nothing is sure anymore. Imre Finta, a former captain in the Hungarian gendarmerie who was charged with war crimes allegedly committed during WWII, died recently at age 90. Finta had faced four counts including robbery, unlawful confinement, kidnapping, and manslaughter in connection with the forced deportation of 8,617 Hungarian Jews from the provincial town of Szeged. Evidence at his trial indicated that after being confined in an open-air brickyard, the Jews were loaded onto sealed trains in inhumane conditions to be sent to Auschwitz or to forced labour in Nazi-occupied Europe. Many died en route. A jury acquitted Finta of all charges, and on March 24, 1994, in a 4-3 decision, the Supreme Court of Canada upheld the acquittal. Legal scholars said the High Court's decision set conditions for conviction so high that it made it virtually impossible to successfully prosecute German war criminals in Canada. The court ruled that an accused must not only be shown to have the requisite mens rea (state of mind) to intend a criminal act, such as murder or kidnapping, but must also realize the act is part of a war crime. The court also allowed an accused to escape responsibility if he or she was merely following orders. The Finta trial came a few years after the federal government amended the Criminal Code to give Canadian courts jurisdiction to try alleged WWII-era war criminals. That move was one of several recommendations in the 1986 Deschenes commission report on exclusively bringing alleged Axis criminals to justice. "Instead, the more cumbersome, time-consuming and highly inefficient process of denaturalization and deportation was instituted in Canada. While numerous individuals have been stripped of their citizenship, none have been forcibly removed. All are still in Canada, either in various stages of appeal or other litigation, or awaiting cabinet's order of removal. Some have been waiting for years." What's more, the Supreme Court decision resonated beyond WWII-era war crimes to modern ones. The same tests that were articulated in Finta would apply to modern day war criminals. 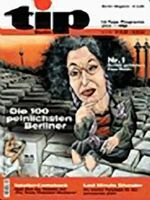 Lea Rosh, the German woman who was the driving force behind the creation of the Berlin 'Holocaust' memorial, was named by Berlin Tip magazine the most embarrassing Berliner of 2003. The construction of the memorial was temporarily halted because the Degussa firm, producer of a chemical making the memorial stones graffiti-proof, was accused to have owned shares of the DEGESCH firm that produced Zyklon B during WWII. Another 'Holocaust' survivor tale appeared in the December 2003 edition of the Australian Jewish News. Lou Sokolov claims that his Auschwitz survival was a miracle because he belongs to "one of the only Jews" who entered the crematorium and came out alive. From August 1942 to late 1944 Sokolov, along with assistants, tattooed the arms of 200,000 Jews from Holland, Belgium, Yugoslavia, Norway, Germany, Greece, Italy, Latvia, Austria, and Hungary. "When two men, one dead and one alive, were registered with the same number, Sokolov had to go into the crematoria to verify the number on the dead man's arm." He recalls witnessing daily suicides by people who threw themselves against the electric fence - when the rear of the camp was open! "On January 19, 1945, as the Russians approached, Sokolov joined one of the last groups to march out of Birkenau." That sounds like he, like Elie Wiesel, was given the option to either stay and be 'liberated' by the Red Army or to leave with the Germans, and he apparently decided to stay with his beloved, atrocious mass-murderers. "Further, the comments by Mr. Justice Blais that the book Covert Entry is a 'novel', prior to hearing any evidence on Zundel's part concerning the background to this book, which will be heard during the hearing proper on the certificate, raises an apprehension of bias on the part of Mr. Justice Blais given his background as the Solicitor General of Canada in charge of CSIS. The book charges CSIS with serious matters concerning Zundel, namely, that it had foreknowledge of the bomb which was sent to him in 1995. That Mr. Justice Blais would immediately brand the book a 'novel' and begin to aggressively intervene in the questioning of Zundel on the book, raises a reasonable apprehension that Mr. Justice Blais, as a former Solicitor General in charge of CSIS, would not be impartial in considering and judging Zundel's allegations against CSIS." From Barrister Doug Christie's submission that Justice Blais recuse himself from the case, which the judge refused to do. December 2003. On January 13, 2004, the Lyon administrative court of appeal confirmed the validity of revisionist scholar Jean Plantin's university degrees, thereby dismissing an appeal lodged by the universities Lyon II and Lyon III. The Court ruled that a university administration may revoke a degree only within a four month period and that this needs to be done legally. The court upheld Jean Plantin's successful appeal to the County Court in June 2003 that the universities' decision to revoke his two degrees - "maîtrise d'histoire" and "diplôme d'études approfondies" - was illegal. In June 2000, the University Lyon II decided that Jean Plantin's DEA diploma, obtained 10 years before (1990), regarding the "Investigations about the typhus epidemics in German concentration camps," was not valid because one of the jury members was absent. In July 2001, the University Lyon III, who, ten years before, had granted Jean Plantin a diploma because of his work about Paul Rassinier, decided finally that his work was "unacceptable". On July 8, 2003, the European High Court in Straßburg dismissed as inadmissible the appeal filed by French revisionist Roger Garaudy against a decision of the French penal courts. The French courts had sentenced Garaudy for his 1995 revisionist book The Founding Myths of Israeli Politics to a suspended prison term of nine months and a fine of 160,000 FF (ca. $30,000). The European High Court ruled that revisionist theses instigate hatred against Jews and are therefore not protected by constitutionally guaranteed freedom of speech. The trial of 34-year-old French father of four Vincent Reynouard, author of a book and a video-cassette about the wartime tragedy of Oradour-sur-Glane, was held in Limoges. 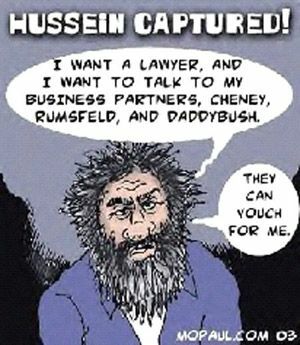 He is charged with "attempting to justify war crimes" via the video-cassette in question. The proceedings were rushed through in three hours. The presiding judge, François Casassus-Builhé, demonstrated a shocking partiality. He forbade the showing of the video. He forbade the cross-examination of the sole prosecution witness. The barrister for the LICRA (International league against racism and anti-Semitism) was moderate. The public prosecutor sought a n unsuspended sentence of one year imprisonment. Eric Delcroix was brilliant in his defence of V. Reynouard. The correctional court of Limoges announced its judgment on Dec. 12, 2003: Vincent Reynouard was sentenced to one year imprisonment, nine of which were suspended, and was ordered to pay a fine of 10.000 euros; all files seized by the Belgian police remain confiscated; Reynouard has a probabtion period of three years, has to pay one euro of symbolic damages to three suing parties, and 1,000 euros of expenses for the lawsuit. Reynouard's 'accomplice' Guy Dubois received a suspended term of three months imprisonment and a fine of 2,000. The trial was accompanied by hysterical war propaganda programs by the French media. Question: If it takes 200,000 US troops eight months to capture one geriatric 'despot', then how long would it take... Oops! Sorry. It took them so long to capture the geriatric 'despot' that I've forgotten the rest of the question. On November 9, 2003, the "Association for the Rehabilitation of Those Persecuted for Challenging the Holcaust" was established in Vlotho, Westfalia (Germany). The event was attended - in person or by proxy - by famous revisionists like Ernst Zündel, Ingrid Rimland, Robert Faurisson, Germar Rudolf, Jürgen Graf, Gerd Honsik, Wilhelm Stäglich, Fredrick Töben, Andres Studer, Hans-Dietrich Sander, Manfred Röder, Frank Rennicke, Hans Schmidt, Anneliese Remer, and others. This human rights group intends to fight for everybody's right to freely investigate the biggest taboo of western societies. Anbody who wants to assist this human rights group may contact it via Mr. Mahler, Weidenbusch 13, D-14532 Kleinmachnow (Germany). Membership is currently only €10 ($12) per month. On Nov. 21, 2003, the periodical of the French government (Journal officiel de la République française) published e decree of the day before announcing the nomination of "an ambassador for the international dimension of the Shoah [Holocaust], of robbery and the duty to remember." Jacques Huntzinger, Plenipotentiary Minister 1st class, will be this ambassador. The decree was signed by Jacques Chirac, President, Jean-Pierre Raffarin, Premierminister, and Dominique de Villepin, Minister for Foreign Affairs. In May 2002, Randolph Marshall Bell was declared Special Envoy of the USA for Holocaust Issues. Bell headed the U.S. group assisting in organizing the 1997 London conference on "Nazi gold." He also worked closely together with the U.S. department of revenue to come to an agreement with Austria in 2000/2001 regarding reparation payments for forced labor and expropriations. (www.state.gov/p/eur/rls/or/2002/12692.htm) The psychological gagging and financial plundering of Germany is perfectly organized. As reported in TR 3/2003 (pp. 308-312), Rachel Corrie was the heroic Jewish volunteer who was crushed to death in Rafah, Gaza, in March 2003 as she tried to prevent an Israeli bulldozer from demolishing a Palestinian home. As a reaction to this, Palestinians rebuilt the home, which she tried to protect, and converted it into a memorial for both Rachel Corrie and Nuha Swaidan, who was a pregnant Palestinian woman who was also killed by a bulldozer during a house demolition in Gaza. However, the owner of this memorial promptly received a new demolition notice on Sept. 29, 2003. The property is home to Bait Arabiya and Salim Shawamrah and their seven children who have watched Israelis demolish their house four times before. The official reason for demolition is there was no building permit. 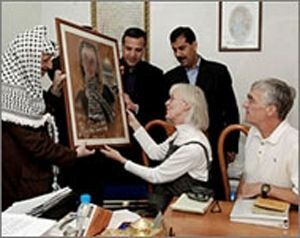 In the meantime, Rachel Corrie's parents visited the Arabiya property in support of their quest and were also received by President Arafat (see picture). The Bait Arabiya property has become a symbol of peaceful resistance not only to occupation but to Israeli's sustained campaign to displace Palestinians from their country altogether. "And in Europe, which bears the mark of Cain for its complicity in the Holocaust, the Arab-Israeli conflict has become a means of absolving guilt. In turning Israelis from victims into Nazis, they [non-Jewish Europeans] seek to cleanse their consciences by casting their sins upon us [Jews]." This comment is interesting for two reasons. First, it shows that the Holocaust doctrine is indeed used by certain groups of powerful Jews as an ideological battering ram against all non-Jewish Europeans. Notice that Rabbi Yoffe labels all of Europe with the "mark of Cain." Just as it is socially and morally acceptable for Jewish groups like the ADL to proclaim as its mission the ending of the defamation of the Jewish people, so it should also be with non-Jewish Europeans. What is good for the goose is good for the gander. It should be socially and morally acceptable for non-Jewish Europeans to work to expose the lies and exaggerations in the Holocaust ideology, which in turn are used to defame all non-Jewish Europeans. This is one of the reasons why the mission of The Revisionist is so vitally important. By exposing Holocaust lies and exaggerations, the journal is helping to end the defamation of all of European peoples. "And in the Jewish Community, which bears the mark of Cain for its complicity in the crimes of Communism, the Nazi Holocaust has become a means of absolving guilt. In turning all non-Jewish Europeans into Holocaust perpetrators, the Jews seek to cleanse their consciences by casting their sins upon non-Jews." Any European or American leader that made a statement like this would immediately be branded an 'evil anti-Semite.' Indeed, in certain European nations he may even be put on trial for 'hate crimes.' Contemporary Western society 'allows' Jews to use the Holocaust as an ideological battering ram against non-Jews. But non-Jews are absolutely forbidden to use the crimes of Communism as a battering reproach against Jews. Hypocrisy abounds. Source: The Revisionist 2(1) (2004), pp. 116-120.